When a startup takes VC funds, they usually accept the premise that they need to “get big fast”. VCs don’t fund lifestyle businesses. For an entrepreneur focused on growth, it seems natural that they should “get the word out” about their new innovative solution. Thus many startups quickly launch awareness building initiatives ranging from advertisements in a tech magazine to exhibiting at tradeshows. Generally this is a complete waste of money. While experienced marketers recognize the need for some positioning work upfront, they still generally lack a broader understanding of where to focus resources and in which order. He warns that a company should not kick into growth mode until reaching the fourth step. By this point they have figured out a sustainable and scalable process for acquiring and monetizing customers. If you haven’t read the book, I highly recommend it. For a more detailed overview of the book see this post from Eric Ries. The approach I’ve used to attract 10s of millions of users to startups is similar, but allows growth a little earlier (click graphic below for full size). Within a few weeks of initiating the understand phase, we generally have enough user insight to baseline allowable acquisition costs of a new user and begin iterating. It can be tempting to start building all customer acquisition channels that fall within this allowable acquisition cost, but finding and managing these channels takes too much time to already be a priority. Instead, we just want to generate enough new user volume to iterate landing pages and sign up flows. These iterations can increase the allowable acquisition cost by more than 10X in only a few months. At the completion of the iteration phase we can put all of our energy into building profitable customer acquisition channels. With a much higher allowable acquisition cost, the process of building profitable channels is relatively easy (and even fun). I recommend starting with free channels first and ultimately spending up to your allowable acquisition cost. This recent post gives more details on building these channels. Steve Blank and Eric Ries presented their lean startup approach to a very receptive crowd at last night’s Startup2Startup dinner in Palo Alto. Here’s a link to the must watch video. Following the presentation each table discussed the topics over dinner. I was pleasantly surprised that the entrepreneurs at my table had all implimented some form of customer development and agile development. This is awesome guidance considering the countless hours I saw wasted at my first startup where people debated decisions that had little impact on results. On my marketing team I quickly ended these debates with “test it.” When debates extended across departments I abdicated the decision to others but measured the results to make sure they weren’t negatively affected. At LogMeIn (my second startup) the goal was to start a testing and analytics culture on the marketing team right from the beginning. Rather than hiring someone with a traditional marketing background, my first marketing hire had an actuarial background (the people that assess insurance risk). Next we hired a super fast web designer/developer and an equally fast copywriter. This team was able to rapidly iterate everything to determine combinations that generated optimal conversions. One warning before hiring a math wizard to lead your analytics is that they will often want sample sizes that almost completely eliminate doubt that you are making the right decision. With the volume of users at most startups, this would limit you to very few tests. When I suggest the following mental exercise to a mathematician, they usually come around to high velocity testing with lower certainty. I suggest that they try modeling the results of 25 tests with 80% certainty compared to 5 tests with 95% certainty. I also explain that we can always go back and test it again when we have higher volume. But some decisions are a lot harder to test and require more up front traditional research. For example, when trying to understand the motivations behind users’ actions (or lack of actions) I generally interview and/or survey them. But as Robert Cialdini points out in his latest book: “We know that people’s ability to understand the factors that affect their behavior is surprisingly poor.” So in the past, this research often confused rather than enlightened me. It wasn’t until I read Four Steps to the Epiphany that I realized you could take a more scientific approach to understanding user motivations. Steve Blank recommends starting with hypotheses around the key factors that will be important for building your business – such as the real problem you are solving and the people who are most motivated to solve this problem. 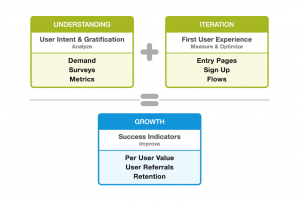 By engaging prospective and actual users you can validate and/or refine these hypotheses. Unlike the previous approach to surveying, we now gain clarity with more user input. Still I know there is a lot of room for improvement in my scientific approach to understanding user needs and motivations, so I recently brought on someone to help me take my research and analytics to the next level. He is Molecular Biologist as well as an entrepreneur who earlier in his career spent 10 years in biotech research. It should be interesting to see what happens when he applies his rigorous research approach to customer development. He’ll be joining me for my two projects that start next month. At early stage web startups we have the distinct advantage over established companies of starting with a blank slate, making it possible to set up much more controlled experiments. In addition to making better use of tight startup time and money, we also hope to leverage the blank slate to challenge some long held marketing beliefs regarding what really works. It seems there are two camps of “evolved” marketers these days. One group recognizes that it is critical to understand customer needs by engaging them at every opportunity. The other group is completely focused on metrics driven iteration. Until recently, few combined these powerful forces. I started in the camp of online metrics and scorned the beanbag marketers who didn’t “get” analytics. At Uproar in the mid to late 90s, metrics were our competitive advantage. We tested, measured and optimized everything. We knew we couldn’t afford any waste if we were going to have a chance to beat the heavily funded Silicon Valley gaming startups and the established companies getting into online games (Microsoft, Yahoo, Sony). Ultimately, this obsession with leveraging metrics to track ROI and improve conversion through iteration was key to becoming the worldwide leader in online games and peaking at a billion dollar stock market valuation. Despite their much deeper cash war chests, the beanbag marketers couldn’t compete with our no waste metrics driven approach. Today the Darwinian economy has killed off most web businesses that don’t leverage metrics, so this is no longer a competitive advantage – it’s a necessity. But many web marketers stop there. In my next startup I was fortunate enough to have a venture capitalist who helped take our approach to the next level. We attracted his investment with our metrics driven online marketing approach and then he quickly improved it. He constantly grilled me with the question “Who is your customer?” During our weekly meetings he never failed to ask about the last time I spoke to a customer. I got extra brownie points for meeting with customers in person. To be honest I initially focused on engaging customers just to appease this VC. But it didn’t take long until I was able to use this information to improve results. Informed iteration helped us increase purchase transaction rates 10X in just a few months, which made scaling a profitable marketing spend infinitely easier. Later customer engagements uncovered revenue opportunities we never could have found through metrics driven iteration. These revenue opportunities eventually accounted for more than half of the company’s overall revenue volume – making possible the eventual IPO filing. It wasn’t until I began the Interim VP Marketing role at Xobni that I discovered Steve Blank’s The Four Steps to the Epiphany. This book added a systematic process for uncovering the critical information needed to build a thriving business and keep improving results. The great news is that Steve Blank recently started blogging at steveblank.com. Perhaps even better news is that Venture Hacks now records Steve Blank’s lectures at UC Berkeley and posts them online. The same Darwinian forces that made metrics a necessity for online marketers are once again shaking up the web startup world. 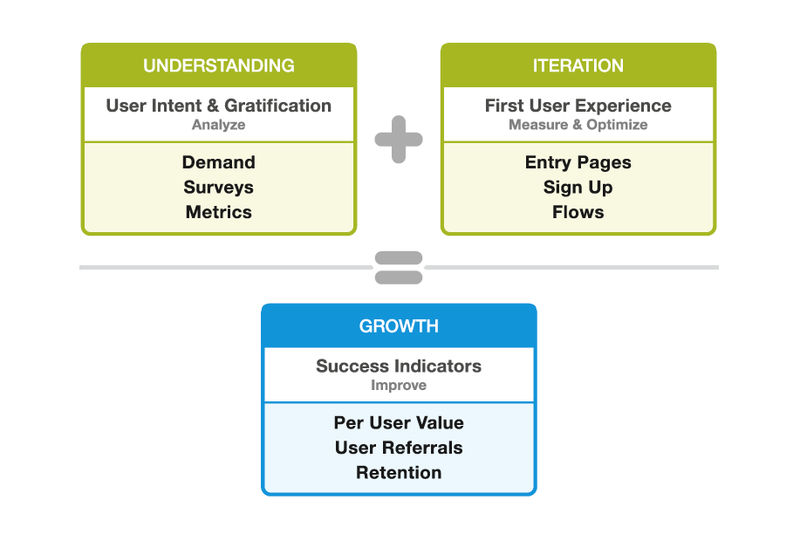 It has become a major competitive advantage to combine Steve Blank’s customer development approach with informed metrics driven iteration. And it’s only a matter of time until this approach becomes a necessity for survival. So what’s next? I’m certain that eventually a platform will emerge that ties it all together. This platform will facilitate the process of collecting and analyzing actionable customer information and manage the iterations that deliver optimal results. Up to this point we’ve always had to custom develop these tracking and reporting systems, while using disconnected systems to drive understanding (surveys, Excel…). Off-the-shelf analytics programs have been bloated with data that is useless for improving results. Rather than holding my breath for someone to deliver this dream platform, I’ve been advising KISSmetrics as they work to create it. I’ve given them total visibility into my approach and turned over reports that have evolved over many years of execution. Of course they have given me equity in the company – but I’d be passionate about this metrics driven customer development platform either way. The first chasm most startup marketers face is not the well-known chasm originally described way back in 1991 (jumping from early adopter to mainstream users). Instead, it’s the chasm from “click” to “gratification” experienced by website visitors. In my direct experience with six startups and indirect experience with several others, it has become clear that the majority of new people that visit a website receive zero gratification. In other words, they do not experience any benefit from the product or service being offered. Without gratification, it is very unlikely they will generate transactions or positive word of mouth/virality. In fact, I generally assign a negative value to these people because any brand awareness created is saddled by the memory of wasted time and effort. Most companies concentrate resources on the two sides of this chasm. The product team focuses on creating a fantastic product experience for those who make it to the other side of the chasm, while the marketers are busy trying to stuff as many people into the top of the acquisition funnel as possible – often at a large expense. The negative experience and wasted money happen in this no-man’s-land between the click and a gratifying experience with the product. It is into this chasm that the majority of online marketing dollars are lost. My first startup marketing experience in online games at Uproar.com was helpful for developing skills in all three of these areas. Games are all about engagement and we were able to surface this engagement early in the user acquisition flow. In 1997 we introduced a syndicated widget/app that is generally considered to be the first of its kind. This app appeared on tens of thousands of websites and “extended” our game play experience to these sites. Users would visit a web page on the affiliate’s site which would automatically start an embedded animated trivia game. Players with a qualifying score were given an opportunity to enter a weekly cash prize drawing. If they didn’t qualify, they were asked to try again. Only after they completed this gratifying experience did we ask them to fill out a registration form. Upon completion of the form, they were told that they were now eligible to win cash prizes in other games on the Uproar site. They would then see a list of games and the next prize in each game. Once they entered the game and began chatting with other users, we had them. They became part of the community and one of the “stickiest” sites on the web. This approach was the key to becoming the biggest game site in the world prior to Uproar’s acquisition by Vivendi Universal in 2001. Of course not all products/services can engage users like a game site does. Still, there are important lessons that can be applied about surfacing your primary benefit early in the acquisition process and drawing users into the core experience. LinkedIn and other websites have done a fantastic job with the “% completed” box that appears next to your profile. Rather than having the barrier of asking for all the information up front, they ask for it gradually. Free trials are another way companies have offered a gratifying experience before asking users to commit. But with a software product, there are still several costly steps required before the trial begins. These include the challenge/risk of downloading software and the time it takes to learn how to use the product. If a company can sprinkle in a gratifying experience through this process, people will remain engaged. At LogMeIn we took it a step further and rewarded prospects for their effort with a completely free version of the software. Prospective customers knew they would be rewarded for their effort downloading/learning the software even if they didn’t upgrade to the premium version. This helped get LogMeIn eventually installed on over 50 million devices. Another example is Tripit, whose process I described here. Can you think of examples of how companies have bridged the chasm between click and gratification? If you’ve benefitted from this post, I’d appreciate it if you could give back to me and other readers by posting suggestions (in comments) of other sites that have effectively bridged this chasm.